When it comes to Canadian cuisine, the first thing that comes to mind probably isn’t bar or pub food. Every region has their own speciality and preference with these good eats, from chicken wings with bleu cheese dressing to bangers and mash or your traditional pickled egg. In Canada, however, there is one dish that is fully unique and wonderfully tasty. That dish, of course, would be poutine. You can find poutine outside of Canada as a dish called “Chips, Cheese, & Gravy” [or “Fries” if you live outside the UK]and the description is an accurate one. Poutine is simply French fries, fresh cheese curds, and brown gravy if you’re talking about the traditional dish. It is so popular in Canada that you can pick up some poutine at a McDonald’s if you really need some! Considering how easy it is to make, however, why settle for mass-produced frozen poutine when you could make your own at home? And why not try out your own variation on this dish that is listed as a Top 10 Canadian invention by CBC Television like this one: a poutine gyro? How Did Poutine Get Its Start? There are a few fanciful tales about how this popular Canadian dish first came about in the 1950’s. Maybe the most widely told story is that Fernand Lachance told everyone that it would “make a damn mess” when he was asked to put some cheese curds onto some fries. The gravy, as the tale goes, was later added because the fries would “get too damn cold” while trying to eat them and the cheese. Whether you believe this tale or one of the others, they all have one thing in common: poutine came from Québec. The word “poutine” dates back to 1810 and one of the most common definitions of the word throughout time has been that of an “unappetizing mixture of various foods, usually leftovers.” Some say it is the Canadian version of the English puddings, while others say it is more like a classic chili-cheese fries type of dish. It may not be the healthiest dish you ever eat, but it is wonderful on the taste buds! Since poutine migrated out of Québec, different regions put their own take on this classic Canadian dish. You might find a poutine with Bolognese sauce and spicy sausage. Shredded cheese instead of cheese curds is a pretty common substitution. You might find ground beef and onions added to a classic poutine recipe. Even a Greek poutine that has feta cheese has been known to happen! Today, however, let’s take a look at one of the best variations of this dish and create some poutine gyros. Step 1: Get your fries ready. Frozen fries that are baked will do for this dish, but if you’ve got a fryer at home, I recommend using it. 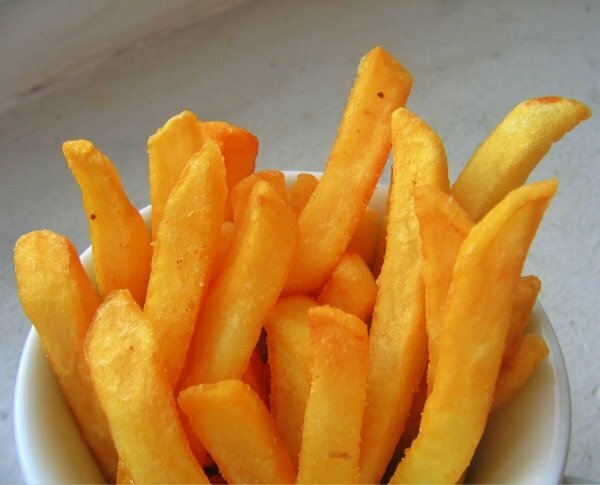 The best option is to cut your own fries from fresh potatoes, of course, creating a medium-size fry instead of wedges. There’s not always time for scratch fries, however, so go with whatever works for you. Step 2: Prepare your gyro meat. You can also short-cut this step by purchasing pre-made gyro meat to just heat up according to instructions. If you want to make your own gyro meat from ground lamb, I highly recommend this recipe from Food Network’s Alton Brown. There’s a Tzatziki sauce you could make in that link as well! You may also substitute pork or chicken for the lamb in the linked recipe as well for a more authentic Greek flavor. Whatever you decide to do, get your meat simmering and then proceed to the next step. Step 3: Chop your veggies. You’ll need one medium tomato and one small onion. Chop these up as the meat is cooking, then set to the side. Then you just mix everything together. Use the water only enough to create a spreadable sauce. Mind you that this is a pretty spicy sauce, so be prepared for a decent kick! Step 5: Finalize your poutine. Put your finished fries/chips down on the plate first. Then spread some of the sauce on the fries, but not too much otherwise even crispy fries become soggy! Then put on the veggies on next, followed by the meat you’ve chosen. Add more sauce on top of this and then finalize your poutine gyros with a sprinkle of feta cheese right there on top! And that’s how you can make your own poutine gyros at home. Do you have a favorite variation of poutine that you enjoy? Share it with us in the comments below!